Kungsleden has extended its lease agreement with the Hotel Plaza in Västerås with 15 years until 2032. The agreement covers the lease of 11,440 square meters in the centrally located property Lorens 14, also called Skrapan. Västerås is an important growth and logistics center with a strategic location close to the E18 motorway, as well as good connections to Stockholm and the rest of the Mälardalen region. Kungsleden’s Västerås City cluster is concentrated around the central parts of the city and includes the landmark Skrapan building. Kungsleden owns a total of 153,000 square meters leasable area in Västerås City and is the largest commercial property owner in the city. Hotel Plaza, which is now a member of Best Western Plus Hotel, is in the final phase of a complete renovation, which will further strengthen the brand and concept. 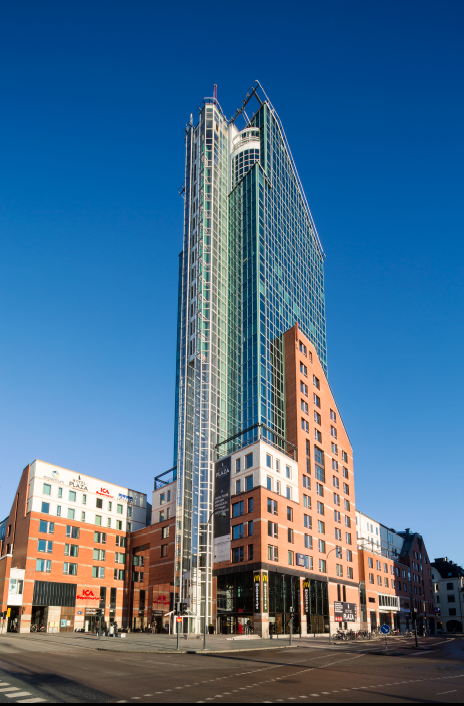 The lease agreement with Kungsleden enables 100 rooms to be renovated and a Sky Spa to be built on floors 23 and 25. Kungsleden will also now start construction of a new hotel entrance. “We are happy about our partnership with an ambitious tenant that wants to contribute to Västerås City. For Kungsleden, it is important to have a strong hotel operator that constantly strives to develop its concepts and business. This initiative is further proof that the area is sought after and that Kungsleden is an attractive development partner,” says Mats Eriksson, Head of Real Estate Mälaren Valley at Kungsleden. “The prolonged cooperation enables us to invest in a completely new and unique spa experience, complete the renovation of all 202 rooms and corridors, and build an entirely new hotel entrance. All this makes our accommodation even more attractive to guests. I have wanted to take this step for a long time and it is fantastic to be able to realize it together with Kungsleden,” says Tobias Hultberg, CEO of Hotel Plaza, Aros Congress Center and Hotel Esplanade. The information was provided for public release on 17 March 2017 at 07:00 a.m.
Kungsleden is a long term property-owner that provides attractive, functional premises that enrich people’s working days. We create value by owning, managing and developing offices and other commercial properties in Stockholm and Sweden’s other growth regions. A large portion of our properties belong to attractively located clusters where we also engage in the development of the whole area. Kungsleden’s goal is to deliver an attractive total return on our properties and for our shareholders. Kungsleden is listed on NASDAQ OMX Nordic Large Cap.